At around 4" tall these aren't really "mini figures," but like the Wendy's Weird Writers I thought they were worthy of a post anyway. 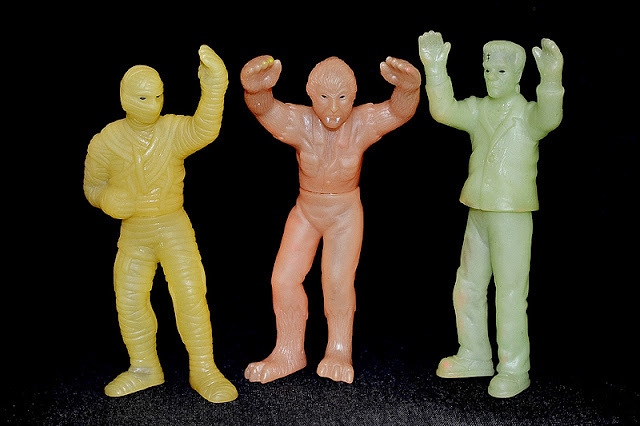 They are three Universal monster figures--The Mummy, Wolfman and Frankenstein's Monster--that were offered as prizes in kid's meals at Wendy's fast food restaurants in 1992. Aside from a touch of paint on their faces they're monochromatic, and are made of a firm-yet-flexible soft plastic. They are actually hollow inside and each can be pulled apart a the waist into two pieces, so I'm not sure if the intention was to be able to mix-and-match monsters or what. I've always liked these guys and remember using them as Halloween decorations around the house as a kid. Unfortunately these are the only three monsters in the set (I always thought a blue glow Dracula would have been a natural fourth). I have two of the three and live 'em, gotta find me a wolfman! Ron R, still need a Wolfman one? I have one! Love these glow toys, they are just cool! I just found my first one of these at a yard sale..still in the package. Can't decide if I want to open it or not...they are pretty neat. Nice find! White Castle had some cool kids meal toys and they're not nearly as common as ones from McD's, Burger King, etc.